How Anthony Kennedy’s retirement decision became a battle over the Trump presidency. How Justice Anthony Kennedy’s retirement decision became a battle over the judiciary and the Trump presidency. Supreme Court Justice Anthony Kennedy attends a ceremony in the Rose Garden at the White House on April 10. Two D.C. stories collided on Thursday when the 4th U.S. Circuit Court of Appeals handed down a 10–3 decision in International Refugee Assistance Project v. Trump, affirming virtually all of a Maryland district judge’s nationwide injunction against Donald Trump’s second try at an executive order limiting travel and immigration from six majority-Muslim countries. One story is about how a largely horrified judicial branch is the last, best check against Trump’s truth-challenged mayhem. 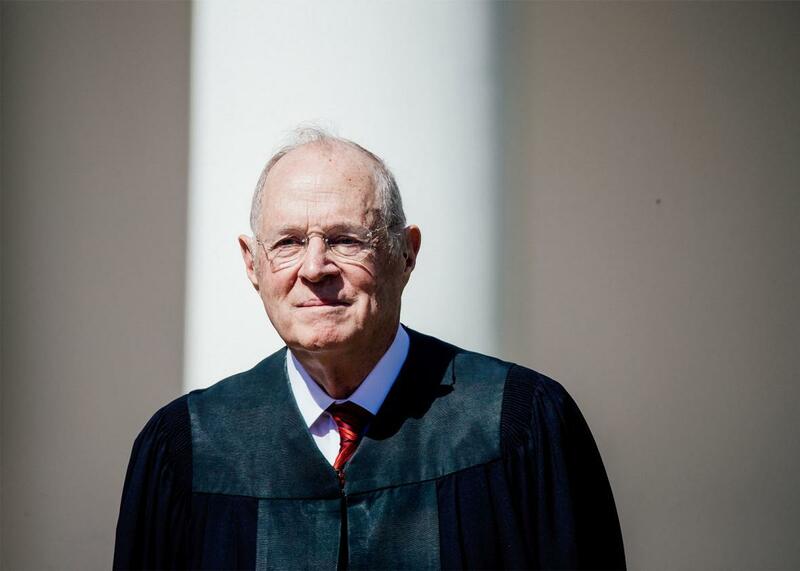 The other is whether Justice Anthony Kennedy is poised to announce his impending retirement. These two stories are now inextricably linked, because there is almost no way to read the 206 pages’ worth of opinions in IRAP as anything other than a ransom note from the federal judiciary directed solely at Justice Kennedy. It goes without saying that the bulk of these rumors seem to be fanned by conservative news outlets, eager to point out that Kennedy is both desperate to leave and also either unaware of or unbothered by the chaos Trump has unloosed upon the planet. A cynic might argue that the White House and movement conservatives are in fact signaling to Kennedy that he really should step aside, and that by keeping the prospect of a second Neil Gorsuch—arguably Trump’s only success as president—fresh in the minds of Republican voters, one might look past the shambles, grift, and lawlessness of everyday life in Trumpland. The president’s pledge that he will draw his next Supreme Court nominee from his original list of 20 judges is thus simply code for, Sure, everything else I do is dangerously deranged, but trust me, Justice Kennedy, your legacy will not be ruined with the seating of someone insane. But the truth is that Kennedy isn’t talking, and your guess is as good as mine as to whether the court’s centrist Republican will be bothered by the prospect of leaving his seat in the hands of someone currently operating under the shadow of an FBI investigation. On the one hand, we know Kennedy worries more about civility, decorum, and the rule of law than virtually anyone on the high court. On the other hand, we also know Kennedy shares a close relationship with the Trump family: His son Gregory worked with the Trump team around the inauguration, and Trump’s daughter and granddaughter had seats as Kennedy’s guests at an oral argument in February. To be sure, Justice Kennedy has been hearing stuff like that for decades now, particularly from his critics on the right, and he is likely inured to it. And certainly, if necessity or fatigue leads him to depart the court in the coming weeks, history will applaud his legacy in areas ranging from affirmative action to gay rights to reproductive freedom. Also, Kennedy may well wish to depart the court before it gets locked in uglier battles that will further enmesh the courts in partisan politics, the diminution of norms, and the erosion of international regard for the rule of law in America. But it’s almost impossible to read Thursday’s IRAP opinions as anything but a cri de coeur to Justice Kennedy to remain on the high court at least long enough to shore up his own judicial legacy. More than a few court watchers have pointed out that Kennedy’s views on executive power, immigration law, and the role of the judiciary are very much at the core of the current travel ban litigation. Indeed, as Byron York observes, it may well fall on Kennedy’s shoulders to determine whether the role of Trump himself should be at issue at all when this case heads to the Supreme Court, which it almost inevitably will. That’s why the opinions in IRAP read like a kind of Justice Kennedy’s Greatest Groovin’ Hits album, with citations crashing like cymbals to Kennedy-esque words like dignity, history, freedom, animus, and democracy. Citations to landmark Kennedy opinions reverberate through the opinions and dissents so frequently that it is almost impossible to miss them. And at the heart of the matter, there lies a question about whether courts may be permitted to “look behind” a facially legitimate argument offered by the government if it is deemed to be in bad faith. This is a question that has plagued all of the travel ban litigation: Can Donald Trump’s words and promises about effectuating a “Muslim ban” be laundered out of existence by his lawyers, and then ignored by the judicial branch? The appeals courts are inviting Justice Kennedy, the court’s much-reviled and much-beloved swing voter, to weigh in on the very role of the courts themselves in the Trump era. It’s an invitation—one that is all but engraved in gold and sealed with a white flag—that he may find difficult to ignore. In a case heard only a few weeks ago, Kennedy appeared horrified at the prospect of a Justice Department lawyer asserting that the Trump administration had the right to revoke the citizenship of Americans who’d made inconsequential misstatements in their naturalization proceedings. “Your argument is demeaning the priceless value of citizenship,” Kennedy told the DOJ lawyer. “You’re arguing for the government of the United States, talking about what citizenship is and ought to mean.” It’s hard to imagine that same Justice Kennedy sloughing off what looks to be open religious animus as trivial. Kennedy has a long and storied reputation as a Hamlet-like figure, prone to mulling, musing, and agonizing about his votes in crucial cases. Indeed, this spring’s odd will-he-or-won’t-he performance in the press mirrors that theme in ways that seem more made for TV than the court. Justice Kennedy also has a long and storied reputation as someone who cares about gravity and dignity and decorum, especially when incivility threatens to tear the national public discourse apart. My own belief is that the view of Kennedy as a vacillator and flip-flopper is unfair and overwrought. He knows exactly who he is and what he wants to be remembered for. He has now been invited, by dint of doctrine and history, to be an arbiter of whether the courts will stand as a bulwark against Donald Trump’s chaotic and disrespectful legal worldview. In one of his final acts as a jurist, he may have to decide whether the suddenly much vaunted “presumption of regularity” is due to this executive. It’s hard to imagine anyone wants that kind of pressure in their day job. It’s also hard to imagine that, faced with this monumental task, Justice Kennedy would be apt to walk away.